2010, an excellent year for raytracing! - Octane Render is publicly announced. A demo is released which lets many people experience high quality unbiased GPU rendering for the first time. Unparallelled quality and amazing rendertimes on even a low-end GTX8800, catch many by surprise. - Brigade path tracer is announced, a hybrid (CPU+GPU) real-time path tracer aimed at games. Very optimized, very fast, user-defined quality, first path tracer with support for dynamic objects. GI quality greatly surpasses virtual point light/instant radiosity based methods and even photon mapping, can theoretically handle all types of BRDF, is artefact free (except for noise) and nearly real-time. No screen-space limitations. The biggest advantage over other methods is progressive rendering which instantly gives a good idea of the final converged image (some filtering and LOD scheme, similar to VoxLOD, could produce very high quality results in real-time). Very promising, it could be the best option for high-quality dynamic global illumination in games in 2 to 3 years. - GTC 2010: Nvidia organizes a whole bunch of GPU ray tracing sessions covering OptiX, iray, etc. - one of my most burning questions since the revelation of path tracing on GPU, "is the GPU capable of more sophisticated and efficient rendering algorithms than brute force path tracing?" got answered just a few weeks ago, thanks to Dietger van Antwerpen and his superb work on GPU-based Metropolis light transport and energy redistribution path tracing. Optix 2.1 was released a few days ago and includes a Markov Chain Monte Carlo (MCMC) sample, which only works on Fermi cards (New sample: MCMC - Markov Chain Monte Carlo method rendering. 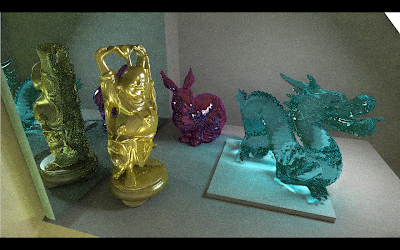 A global illumination solution that requires an SM 2.0 class device (e.g. Fermi) or higher). MCMC rendering methods, such as MLT (Metropolis light transport) and ERPT (energy redistribution path tracing) are partially sequential because each path of a Markov chain depends on the previous path and is therefor more difficult to parallellize for GPUs than standard Monte Carlo algorithms. 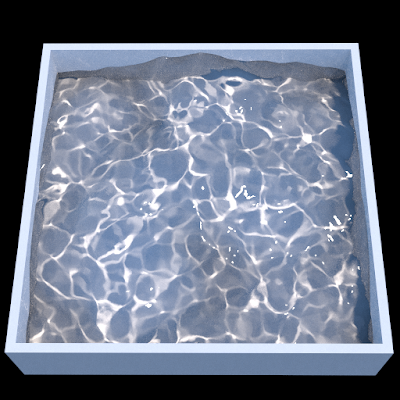 This is an image of the new MCMC sampler included in the new Optix SDK, which can be downloaded from http://developer.nvidia.com/object/optix-download.html. This scene is straight from the original Metropolis light transport paper from Veach and Guibas (http://graphics.stanford.edu/papers/metro/metro.pdf). 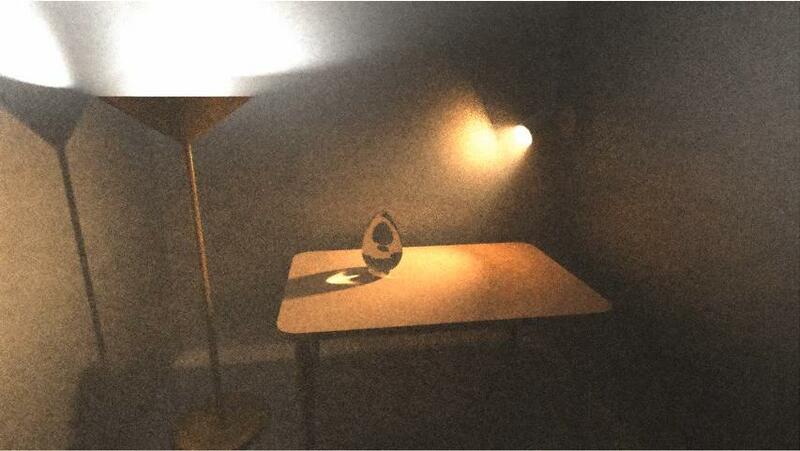 Participating media (like fog, smoke and god rays) are one of the most difficult and compute intensive phenomena to simulate accurately with global illumination, because it is essentially a volumetric effect in which light scattering occurs. Subsurface scattering belongs to the same category of expensive difficult-to-render volumetric effects. The video shows it can now be done in almost real-time with MLT. which is pretty impressive! Move over OTOY, here comes the new AMD tech demo! June 2008: Radeon HD 4870 launches with the OTOY/Cinema 2.0/Ruby tech demo featuring voxel raytracing. It can't get much closer to photorealism than this... or can it? - unidirectional (standard) path tracing: used by Octane, Arion, V-Ray RT GPU, iray, SmallLuxGPU, OptiX, Brigade, Indigo Render, a bunch of renderers integrating iray, etc. Jan Novak is one of the first to report a working implementation of path tracing on the GPU (implemented with CUDA on a GTX 285, https://dip.felk.cvut.cz/browse/pdfcache/novakj8_2009dipl.pdf). The very first paper reporting GPU path tracing is "Stochastic path tracing on consumer graphics cards" from 2008 by Huwe and Hemmerling (implemented in GLSL). - bidirectional path tracing (BDPT): http://www.youtube.com/watch?v=70uNjjplYzA, I think Jan Novak, Vlastimil Havran and Carsten Dachsbacher made this work as well in their paper "Path regeneration for interactive path tracing"
With all unbiased rendering techniques soon possible and greatly accelerated on the GPU, what about GPU acceleration for biased production rendering techniques (such as photon mapping and irradiance caching)? There have been a lot of academic research papers on this subject (e.g. Purcell, Rui Wang and Kun Zhou, Fabianowski and Dingliani, McGuire and Luebke, ...), but since it's a lot trickier to parallellize photon mapping and irradiance caching than unbiased algorithms while still obtaining production quality, it's still not quite ready for integration in commercial software. But this will change very soon imo: on the ompf forum I've found a link to a very impressive video showing very high-quality CUDA-accelerated photon mapping http://www.youtube.com/watch?v=ZTuos2lzQpM. 11 seconds for this quality and resolution on just one GPU is pretty amazing if you ask me. I'm sure that further optimizations could bring the rendertime down to 1 second. The video also shows real-time interaction (scale, rotate, move, delete) with objects from the scenery (something that could be extended to support many dynamic objects via HLBVH). I could see this being very useful for real-time production quality global illumination using a hybrid of path tracing for exteriors and photon mapping for interiors, caustics, point lights. Just like 2010 was the year of GPU-accelerated unbiased rendering, I think 2011 will become the year of heavily GPU-accelerated biased rendering (photon mapping in particular). Real-time Metropolis Light Transport on the GPU: it works!!!! This is probably the most significant news since the introduction of real-time path tracing on the GPU. I've been wondering for quite a while if MLT (Metropolis Light Transport) would be able to run on current GPU architectures. MLT is a more efficient and more complex algorithm than path tracing for rendering certain scenes which are predominantly indirectly lit (e.g. light coming through a narrow opening, such as a half-closed door, and illuminating a room), a case in which path tracing has much difficulty to find "important" contributing light paths. For this reason, it is the rendering method of choice for professional unbiased renderers like Maxwell Render, Fryrender, Luxrender, Indigo Render and Kerkythea Render. 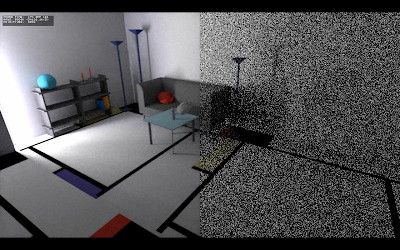 ERPT on the left, standard path tracing (PT) on the right. Light is coming in from a narrow opening, a scenario in which PT has a hard time to find light paths and converge, because it randomly samples the environment. ERPT shares properties with MLT: once it finds an important light path, it will sample nearby paths via small mutations of the found light path, so convergence is much faster. - video 2 showing Kelemen-style MLT (an improvement on the original MLT algorithm) running in real-time on the GPU. The video description mentions Kelemen-style MLT on top of bidirectional path tracing (BDPT) with multiple importance sampling, pretty amazing. Kelemen-MLT after 10 seconds of rendering at 1280x720 on a single GTX 470. The beautiful caustics are possible due to bidirectional path tracing+MLT and are much more difficult to obtain with standard path tracing. These videos are ultimate proof that current GPUs are capable of more complex rendering algorithms than brute-force standard path tracing and can potentially accelerate the very same algorithms used in the major unbiased CPU renderers. This bodes very well for GPU renderers like Octane (which has its own MLT-like algorithm), V-Ray RT GPU, SmallLuxGPU and iray. If Dietger decides to implement these in the Brigade path tracer we could be seeing (quasi) noise-free, real-time path traced (or better "real-time BDPT with MLT" traced) games much sooner than expected. Verrrry exciting stuff!! I think some rendering companies would hire this guy instantly. The author has made some video's of the tech using OpenCL, showing the great detail that can be achieved when using voxels: http://www.youtube.com/watch?v=PzmsCC6hetM, http://www.youtube.com/watch?v=oZ6x_jbZ2GA It does look a bit like the atomontage engine. OnLive just works, even for those darn Europeans! I think this deserves it's own post. Someone (Anonymous) told me that the OnLive service can be accessed and played from EU countries as well, so I gave it a try and downloaded and installed the tiny OnLive plug-in. To my surprise, I actually got it working on a pretty old PC (just a Pentium 4 at 3GHz). I was flabbergasted. I'm about 6000 miles away from the OnLive servers and it's still running! The quality of the video stream was more than decent and smoother than when I try to decode 720p Youtube videos which my system just cannot handle. My first impression: I love it, now I'm absolutely positive that this is the very near future for video games. It's a joy to watch others play and to start playing the same game within seconds! I've tried some Borderlands, Splinter Cell Conviction and FEAR2. There is some lag, because I'm about 6000 miles away from the OnLive server (I got a warning during log-in that my connection has huge latency), but I could nevertheless still enjoy the game. About half a second (or less) passes between hitting the shoot key and seeing the gun actually shoot, and when moving your character . I must say though that I got used to the delay after a while, and I anticipated my moves by half a second. My brain notices the delay during the first minutes of play, but I forgot about it after a while and just enjoyed the game. I think that if I can enjoy an OnLive game from 6000 miles away, then US players, who live much closer to the OnLive servers, have got to have an awesome experience. The lag could also be due to my own ancient PC (which is not even dual core) or to the local network infrastructure here in Belgium even though I have a pretty big bandwidth connection. I can't wait until they deploy their EU servers. Image quality is very variable, I guess it's partly because of my PC, which cannot decode the video stream fast enough. FEAR 2 looked very sharp though. The image looks best when you're not moving the camera and just stare at the scene. The recently announced MicroConsole seems to offer very good image quality from what I've read. I think that cloud gaming will give an enormous boost to the graphics side of games and that photorealistic games will be here much sooner thanks to cloud rendering and it's inherent rendering efficiency (especially when using ray tracing, see the interview with Jules Urbach). My biggest gripe with consoles like Xbox and Playstation is that they stall graphics development for the duration of the console cycle (around 5 years), especially the latest round of consoles. With the exception of Crysis, PC games don't make full use of the latest GPUs which are much more powerful than the consoles. I just ran 3DMark05 some days ago, and it's striking me that this 5-year old benchmark still looks superior than any console game on the market. I truely hope that cloud gaming will get rid of the fixed console hardware and free up game developers (and graphics engineers in particular) to go nuts, because I'm sick of seeing another Unreal Engine 3 powered game. I also think that OnLive will not be the only player and that there will be fierce competition between several cloud gaming services, each with their own exclusive games. I can imagine a future with multiple cloud gaming providers such as OnLive, OTOY, Gaikai, PlayStation Little Big Cloud, Activision Cloud of Duty, EA Battlefield Cloud of Honor, UbiCloud, MS Red Ringing Cloud of Death (offering Halo: RROD exclusively), Valve Strrream... To succeed they would have to be accessible for free (just like OnLive is now), without monthly subscription fees. All in all, it's an awesome experience and it's going to open up gaming for the masses and will give a new meaning to the word "video" game. The incredible ease of use (easier than downloading a song from the iTunes Store) will attract vast audiences and for this reason I think it's going to be much bigger than Wii and will completely shake up the next-gen console landscape (Wii2, PS4 and Xbox 2.5/720/RROD2/...). MS, Sony and Nintendo better think twice before releasing a brand new console. Be it OnLive, OTOY, Gaikai or any other service, I, for one, welcome our new cloud gaming overlords!